"Chandler & Co. Bangor Carnival Parade Float, June 18, 1912"
"The biggest carnival parade ever seen in Bangor, probably the longest parade of any sort ever seen here, passed through the city Tuesday. It was a magnificent aggregation of artistic arrangement of decorative material, beautiful women and children and fine rigs. From where the processions rear rested far down on the Hampden road to the food of Exchange Street, there was almost a continuous line of floats, wagons, carriages, and fire apparatus, the entire horse drawn equipment of the Bangor Fire Department being in parade. As the procession passed along the music of the two bands, the various floats were loudly applauded as now one, then another, party of friends discovered familiar faces or firm names on the floats." 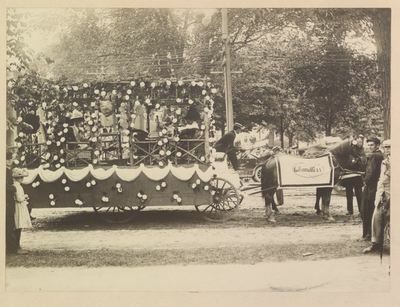 "Chandler's snowball summer house was one of the charming things of the parade. The float was a big one and supported a rustic summer house of cedar, plentifully decorated with evergreen from the cedar tree. Within were well arranged wicker chairs and the effect was exceedingly pleasant. The entire outside of the rustic house was hung with snowballs." James A. Chandler served as treasurer of the company. Chandler's offered "quality and economy in house furnishings" and had "five large floors full of good things." [Source: Bangor city directory of 1912]. Business located at 84-96 Hammond Street. Bangor Carnival 1912, Bangor Maine history, Chandler & Co.